(1) The stiffness coefficients for basic joint component should be determined using the expressions given in Table 6.11.
z is the lever arm from Figure 6.15; P is the transformation parameter from 5.3(7). beff,t,wcis the effective width of the column web in tension from 6.2.6.3. 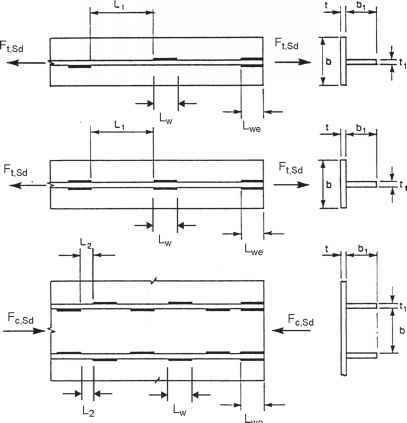 For a joint with a single bolt-row in tension, beff,twc should be taken as equal to the smallest of the effective lengths £eff (individually or as part of a group of bolt-rows) given for this bolt-row in Table 6.4 (for an unstiffened column flange) or Table 6.5 (for a stiffened column flange). rows) given for this bolt-row in Table 6.6; m is generally as defined in Figure 6.11, but for a bolt-row located in the extended part of an extended end-plate m — mx , where mx is as defined in Figure 6.10. £eff is the effective length of the flange cleat from Figure 6.12; m is as defined in Figure 6.13. Lb is the bolt elongation length, taken as equal to the grip length (total thickness of material and washers), plus half the sum of the height of the bolt head and the height of the nut. dM16 is the nominal diameter of an M16 bolt; nb is the number of bolt-rows in shear.